5th Grand Finals Championship Showtime-BACOLOD MASSKARA as Grand Champion as winner! UPDATE: Congratulations to Bacolod Masskara of Bacolod City for being the 5th Grand Champion of Showtime Kapamilya just recently this Saturday, April 28, 2012. Congrats to the winner and champion and to all the contestants of 5th grand championship showtime! It's Showtime Inter-town grand winner is the Bacolod Masskara will receive a P3 million take home which P2 million for the group and P1 million for the city or town they are representing. This is our show, this is our time! It Show time! 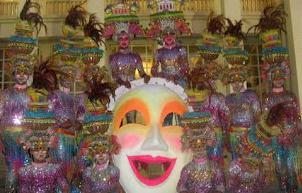 Bacolod Masskara has been the grand winner on 5th grand championship on It's Showtime's Season 5 (Inter-Town Edition) grand finals this only April 28, 2012. Bacolod Masskara is repesenting from Bacolod City (Negros) who got a perfect score of 10 from all 10 judges as the showed their spectacular and best performanced that we should be proud of as a Filipino. Judges included Robi Domingo, Laureen Uy, Maricel Laxa, Angelu de Leon, Richard Yap, Elizabeth Ramsey, Ginger Conejero, Francine Prieto and mainstays Jhong Hilario and Vice Ganda. For all the contestants namely, Lahing Anda, La Castellana, Dumaguete's Pride, Infinite Reform, Amazing Power, Tiklad, and Next Level - They were all bestwith their performances, congratulations to thembut unfurtunately, only held as winner in this 5th grand finalshowtime, andthis is for the Bacolod Maskarra! Congratulations to ASTIG PINOY of Misamis Oriental for being the 4th Grand Champion of ShowTime Kapamilya just recently held at Ynares Center, Antipolo City! Watch the fourth grand finals championship of Showtime Kapamilya on ABS CBN this Saturday December 10, 2011 Live at Ynares Center in Antipolo City at 10:30am! ASTIG PINOY is the Grand Champion of 4th GRAND FINALS Showtime Kapamilya on ABS CBN! This is your show! This is your time, it's Show TIME! All the best! And a strong congratulations to KINGZ GAMBIT of Talisay, Cebu City! We Cebuano/Visayan people are all proud of you! You made it to the finals and as one of the top favorite of madlang people, in their eyes, on our eyes, you're also the Champion! No doubts! Just watch the replay! Kingz Gambit with all the respect from you guys! We are very proud of you, you're a second just a way point behind the ASTIG PINOY! Maybe, a lot of your fans were dismayed but that's their decision (judges' decision), for us, you did a great job and heads up from you! Just continue pushing forward, ladies and gentleman, KINGZ GAMBIT on the move! And to all the participants, Congratulations! It's the SHOWTIME SEASON 4 GRAND FINALS. Just don't miss the excitements and promising casts of participants on an All Star Barangayan and choose your favorite Showtime Contender for who will gonna win the top spot and emerge as the overall champion of Showtime Season 4 Winner!&amp;amp;lt;br /&amp;amp;gt; &amp;amp;lt;br /&amp;amp;gt; For me, of course I will watch it and have my bet to the one and only pride of Cebu, the KINGZ GAMBIT! Watch them and you will amaze their moves! Good luck to all participants and to the KINGZ Gambit, the Pride of Cebu!&amp;amp;lt;br /&amp;amp;gt; &amp;amp;lt;br /&amp;amp;gt; Note: This page is intended for the results of the fourth GRAND FINALS OF SHOWTIME Kapamilya on ABS CBN. Any updates of the said show competition will be updated right here. So, keep updated. Thanks. The lists: Kanlumon Performing Ensemble, Neutron Acrobats, Neutron Acrobats, D'Shots, Kingz Gambit, FMD Extreme, Astig Pinoy, Spy, Pinoy HipHop, Racing Chat, Bailes De Luces, Buli Kidz Incredible, Teatro Ambahanon, Prime Machine, UDC. 4th Grand Finals of Showtime!